How it works: Paying guests get to sample each course in a blind tasting alongside a panel of culinary and celebrity judges in a series of 15 dinner competitions hosted in the four regions of the state. Each evening, two restaurants “battle” it out side-by-side in a single elimination format. Guests savor a six-course menu (three dishes from each chef without knowing whose food they’re tasting) created around a “secret” ingredient. For almost all series, the secret ingredient will come from a North Carolina source. The secret ingredient is revealed to the chefs only an hour before they start cooking and it must be used in each of their three courses Diners, alongside culinary and guest judges, will rate each dish and determine who moves to the next round and who goes home. Contestants: Chef Spencer Carter from the Weathervane in Chapel Hill and Chef Rhett Morris from Rhett’s in Southern Pines. At stake is a grand prize of $2,500 and a coveted red chef jacket. Location: Fire in the Triangle, takes place in Raleigh at 1705 Prime. 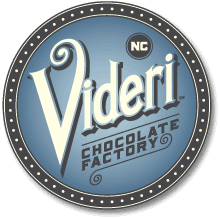 The Videri Chocolate Factory began as the shared dream of three chocolate lovers: Sam, Starr, and Chris. From the moment Sam first sunk his hands into a bag of cocoa beans, he knew he had a love for making delicious gourmet chocolate, and the talent to match. His mission was to turn his passion for handcrafted bean-to-bar chocolate into his profession. Sam’s wife, Starr, and his longtime friend, Chris, came on board to head up the business side of the company, and the three have been having a blast ever since. Topo Distillery and the North Carolina Beer Guys supplied drinks. I loved my spicy Bloody Mary again last night. While we were waiting a basket of bread supplied by LaFarm Bakery was placed on our table. Table 4, my favorite table consisted of Belle my counterpart from Triangle Street Eats, Ryan Conklin, Chef from Rex Health, Collin Jennings and Steve Pexton, members of the Rex Healthcare team, Paul Amburn from Pate Dawson Southern Foods, Adam Moore representing Libbey,Inc. and Muffy and me (Mary Morehouse). We had a great table. Wonderful conversation, sharing of opinions and critiquing of the gastronomical creations served. It was nice having Linda Barnes aka the Belle from our Blog Triangle Street Eats sharing the Competition Dining experience. Sixth Course: Videri Cocoa Nib Southern Tiramisu, Cocoa Nib Cookies, Coffee, Kahlua, Sweet Marscarpone, Charred Cocoa Nib Fluff, Candied Blood Orange, Chocolate-Caramel Sauce. Prepared by Chef Rhett Morris with a score of 24.11. The winner was Chef Spencer Carter from the Weathervane with a score of 28.61 beating out Chef Rhett Morris with a score of 22.82. The cocoa nib was a difficult ingredient to use do to its strong flavor. The evening was filled with interesting preparations; some hits, some misses, but the hard work of the cooking teams and the production done by Jimmie Crippen and his crew are greatly appreciated. Triangle Street Eats is happy to be able to attend and promote these events. A special mention to Ashley Korizis, otherwise known as, The Olive The Sea. It is always nice putting a face to the name. Good luck with your upcoming move to Charlotte. It is wonderful that Twitter, Facebook and the internet will allow us to continue following what we are doing. Hope you win tickets to come again to Competition Dining. Please check out Chef Ryan Conklin’s blog: ‘New School’ Hospital Food – Raleigh, NC. It is very well written and an interesting read. I have my ticket to attend the battle on Feb. 9: Chef Benjamin Harris from the Midtown Grill and Chef Ryan Conklin from Rex Healthcare. I loved what Chef Harris made at the first competition and am excited to experience what Chef Conklin has to offer. I am certain it will be a great battle of interesting gastronomical delights.